Do you like to be liked? Of course you do, particularly if you are using Facebook to market and grow your business. But getting someone to like your page is not the "pot of gold at the end of the rainbow". That is really just the beginning because consistent engagement (i.e. 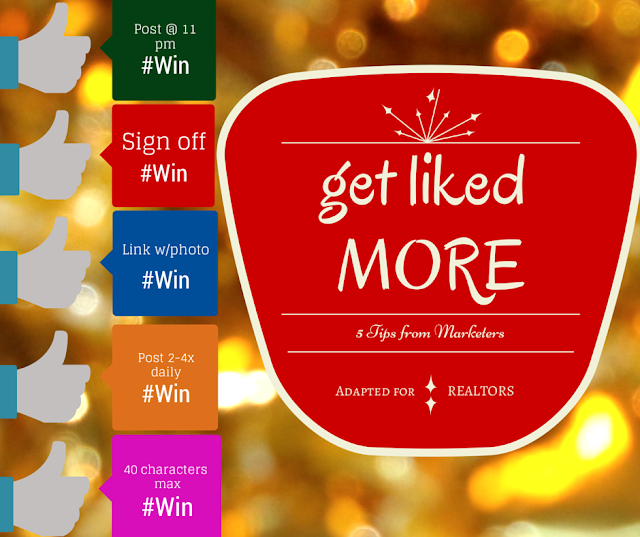 post likes, shares and comments) that spark conversations surrounding your real estate business is the name of the game to effectively using social media to drive your real estate sales, which I discussed in more detail in the no fee guide, Clicking Consumers: Why Engagement Matters for the REALTOR 2.0. If you are on Facebook specifically, here are 5 tips that professional marketers recommend to each other (this is inside information ya'll, in my southern gal drawl) that I had to pull over and adapt to the real estate industry for my fellow agents :). You may be an early bird but posting early has been studied to be less effective. Why? Because it is all about competitive advantage. There is NO advantage to you posting at a time when so many others (whether family, friends or other businesses) are posting (no matter the topic). You probably have personally experienced the "morning information overload" feeling, where there are so many new posts in the morning that you take a cursory glance at all of them and you may click "like" and even add a comment if one is exceptionally funny, relevant or emotional - everything else becomes non-essential. Well, if you have ever run your own social experiment, you may notice that those crack of dawn posts do not elicit the same level of engagement as your after-dinner posts. Try posting in the evening, particularly at 11 pm and see if you get a jump in likes, share or comments. By the way, you can and should automate your posts. You may not always remember to send something out but you can schedule it. One of my favorite tools for automating Facebook posts is BufferApp (which has a free version for basic posting). In the world of social media engagement, you never want to completely "set it and forget it" but such automation apps can help you set it and forget it for a week at a time, freeing up your schedule to actually sell real estate (go figure!). This one was a shocker for me but it is very intuitive after taking a moment to mull over it. Why? Social media is all about displaying a personal touch and feel to everything you do. Writing a post that says, "Imagine if this stunning view was yours." verses, "Imagine if this stunning view was yours. -Terri" is very different. In reading this, did you feel more connected with the post that ended with a sign-off? I did. And, of course, you can and should take your sign-offs up a notch by adding closings that are relevant to your Facebook friends. For example, if you friends list consists mostly of family members and friends, you could sign off "XOXO, Hugs" or if college friends, "Go Blue! (for the Michigan Wolverines out there)", or locals, "Rise Up Falcons! (for Atlanta Falcon football fans)" and so forth. There is no limit to what your sign off can be as long as it is relevant to those who may see it. 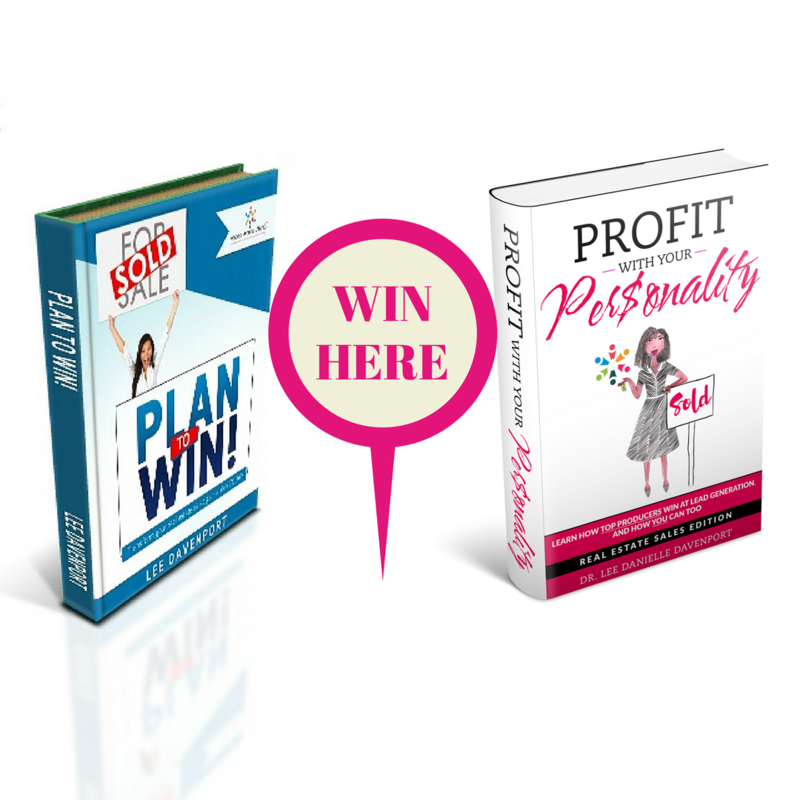 Get personal and get liked more! This one is more for newbies that have not been using Facebook to grow their real estate sales. When we agents get buzz of all of the success to be had that starts from a social media conversation, we like to test the waters and dip a toe in by trying out a few real estate posts. The problem, no matter the social media platform, is that we may commit some social media faux pas, which inevitably leads to little or no engagement from our network. After just a few posts, we may give up in defeat that "I'm just not techie" or "social media marketing is not for my business". If this describes you, trash that defeatist mentality, jump all the way into the waters of social media and be sure to use this Facebook tip: Just Say No to Naked Links. This means post every link with a photo and a short blurb on why this is of interest to your social network. 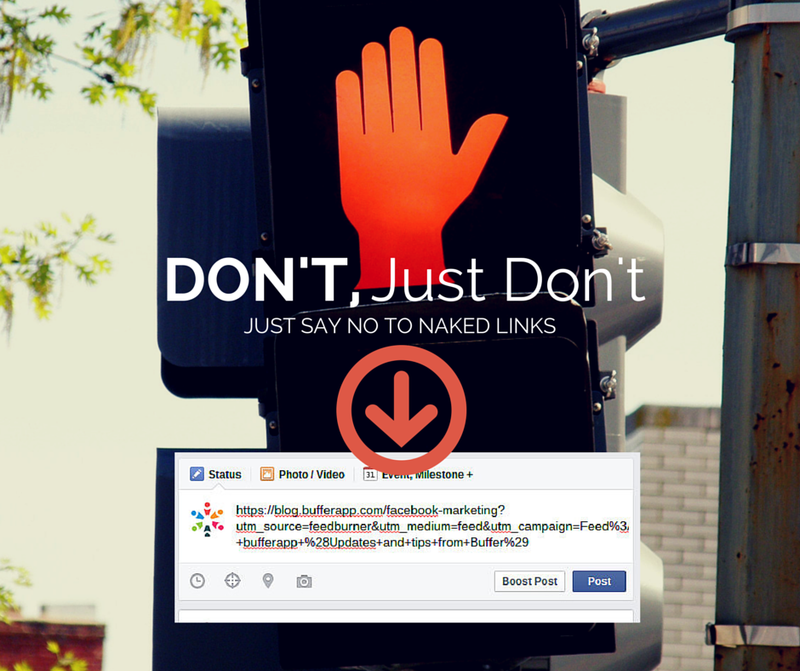 With naked links, your significant other may be the only person to click it because for the majority of your Facebook friends, they probably do not have time to figure out if a naked link has any relevance to them so they will likely skip it. And if your honest with yourself, you will agree that if you saw a naked link in your news feed, it would probably not get a second glance - you may even mute posts from that person if you get too many of them. Screenshot of a Facebook post with a "naked link"
As a bonus, you should "pimp" your photos associated with a link by adding a very short text overlay to the picture. Canva.com is my personal favorite and free way to do this (its free if you use your own pictures or very inexpensive if you use their pictures). Those short blurbs referenced in the last section need to be short! You do not literally have to count out 40 characters every time you post to Facebook. Instead, make it a rule of thumb to post, at most 1 introductory sentence, with every link, photo, event, etc. that you post and share. Why? This gives your network a clue as to why they too may find what you have shared interesting and engagement-worthy. Take the guess work out of your posts for your network, in order to help them engage more by understanding easier what is relevant for them and worth their time to click on. Or maybe you always put a blurb but it is so long, it could be the equivalent to a college term paper. In essence, you wrote so much that no one in your network really even needs to click anymore. Have you ever seen that? One of your Facebook friends retells the entire article and so there is no need to click - stay away from this. Enough is enough. One (to two) sentences is sufficient to give a teaser to get your network clicking away. Marketing gurus have found that posting only once a day leads to a decline in engagement on Facebook. This is understandable because out of sight (or in this case, out of site) = out of mind. In the real world, can you really have an effective conversation that develops a relationship of trust with just one or two sentences? Probably not. It should be no different when we take our conversations online. But on the flip side, those same experts found that posting six times a day on Facebook can also lead to lower engagement from your network. Can you say, "OVER-SHARER!?" Building online relationships with periodic, timely dialogue is completely different from becoming a posting nuisance, who will probably get muted. Therefore, the sweet spot of Facebook posts is found between two and four posts a day. Wow doggy! I know you may feel like posting two to four times every freaking day is a lot and it is, but it does not have to be labor-intensive. 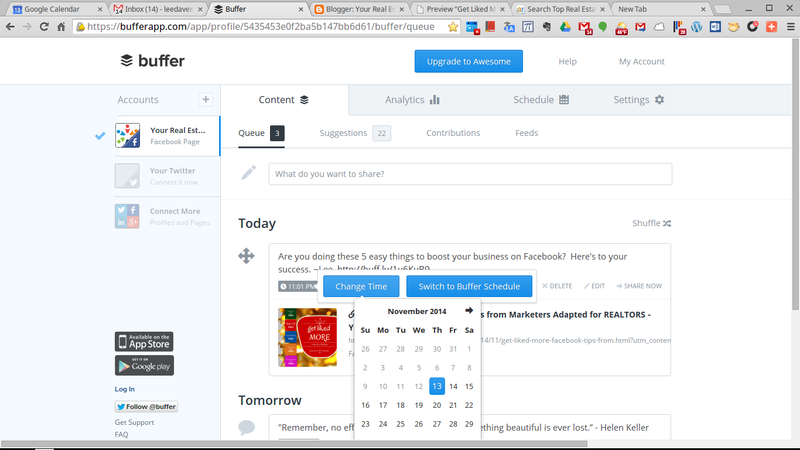 As I mentioned earlier, you can and should use apps to automate your posts. Screenshot of my practicing what I preach! This very article is scheduled to post to Facebook at 11:01 pm tonight. Also, every post does not have to be written by you. If your realty firm sent out an information piece - share it just don't forget to add your short blurb and a photo if there is not one. If your local Board of REALTORS has a great event coming up, share it. If you got a new puppy, share it. If you have an inspirational quote that you feel would encourage your friends, share it. Your posts do not all have to be written, directed and starred in by you nor do they have to be 100% about business (and they probably should not be but there is a gulf of differing opinions on the mix of personal to business posting, which I will not attempt to tackle in this post). If you still need further guidance, join our upcoming no fee webinar, How to Get More with Less on Facebook. Follow me on Google+ and Facebook for more business growth tips and musings. Also, learn how to RE|VAMP your business. Here's to your success!